Listened for, it cannot be heard. You can't know it, but you can be it, at ease in your own life. In Chinese, Qi Gong pronounced "chee gung", translates literally as energy work, or attaining merit from working with energy. Our ancestors have preserved ancient wisdom for our growth and development. It is up to us to teach our children. Qi Gong has been practiced in China for thousands of years. Since ancient times, qi gong has been thought to promote longevity for the body by reversing the aging process, promote the prosperity of a clear and peaceful mind, and keep people happy and smiling. "Knowing the self is enlightenment." Observe your breathing to understand the essential rhythm of your life. Imagine putting water in the mind and fire in the belly. The qi flows like water. By letting the mind be like running water, it can never go stale. Since water always flows to the lowest place, be consistently humble. Let breathing strategy follow flowing postures to accomplish a tranquil mind. Putting the fire below means using abdominal breathing as a strategy to sink the minds focus to the ocean of energy, 1.5 below the navel. This is where you breathed in nutrients as a fetus. This area of focus is called the dan tian, or in Chinese, elixir field, where the immortality pill is stored. Let the fire cook the alchemical soup steadily, not undercooking it, or boiling it over. This means watching the dan tian with a gentle focus like a hen that watches her eggs. On a metaphysical level, "putting the fire below" also means watching thoughts objectively, or turning thoughts around back to their origin, the dan tian. By doing this consistently, an adept gains longevity and enlightenment. Qi is the unseen life force that permeates, surrounds, binds, and powers the stars, planets, volcanoes, oceans, animals, plants, and people. We feel qi projected emotionally when a friend is happy, pensive, sad, fearful, or angry. "Mastering the self requires strength." Gong is the simultaneous practice of devotion, discipline, and diligence. First, you must want to practice. This is the devotion of the spirit. Then, the mind employs discipline to direct the body to practice consistently and diligently. If you practice when you don't want to, it will be dead practice without merit. Make your practice your lifestyle. 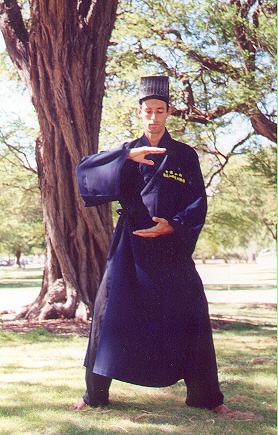 Qi Gong is a twenty-four-hour-a-day activity of guarding the essence. Essence must be guarded so that it may be transformed into spirit. This means eliminating unnecessary activities that drain energy and enhance necessary activities in order to nourish weakness. "He who stays where he is endures." Be like a tree. Make your feet like roots, your legs like tree trunks, and your arms like branches light enough to be blown in the wind. If you're rooted you cannot be knocked over. Qi Gong is an ancient Chinese art that promotes longevity for the body by keeping a clear and peaceful mind. Qi Gong coordinates visualization with deep breathing and flowing posture. Physically, qi gong optimizes organ functions. Energetically, qi gong harmonizes the energy flow through its pathways, or meridians. This practice cleans out and harmonizes the energy flow through its pathways, or meridians. Once these pathways have been properly conditioned, the body begins to heal itself, and soon afterwards, the qi gong practitioner attains the ability to emit and conduct qi, which may be used to heal others. "Perseverance is a sign of will power." Practice consistently and patiently until you attain the desired results. Take your time, and enjoy the journey of practice. The way does not lead to perfection but is perfection. Where you are is home. The qi gong practitioner learns to control physiological functions. Qi Gong stabilizes brain waves, regulates hormone release, regulates body temperature, regulates neural response, increases flexibility, deepens and slows respiration, regulates blood pressure and heart rate, aids digestion, and regulates blood-sugar levels. Qi Gong enables the practitioner's mind to control the body by simply following the natural tendencies of energy. Living naturally promotes the prosperity of peace through contentment. There is enough qi to go around for everyone, and its free. Let the lungs turn the air into qi. Then let the kidneys receive it, so it can be stored as essence in all the vital organs. Let the liver stabilize the emotions. Let the heart rule the body with compassion. Let the spleen focus its good intent with undying stamina. Let the vital organs contribute their spiritual aspects to the universal mind. Stretch your consciousness into heaven. "To die but not to perish, is to be eternally present. Qi Gong has three primary applications, healing art, martial art, and spiritual art. In healing art the qi is focused through a point to nourish the good qualities in a person with a hand, needle, herbs, or food. In martial art the qi is focused through a point with a strike in order to separate the spirit from the body. In spiritual art, qi gong is an energetic offering to the source of creation, a moving meditation. Heaven is a state of mind. The mountain may be crumbling below your feet but your spirit is still happy. Contact Michael Hamilton, L.Ac. at 808-728-2954 or info@lotusspace.com. Ongoing classes meet on Wednesday evenings 5:30-6:30pm at Kapiolani Park Bandstand, and Friday mornings 8:00-9:00 am at Kaka�ako Waterfront Park.